Aluminum in dilute sulfuric acid solution can be detected with cesium sulfate. 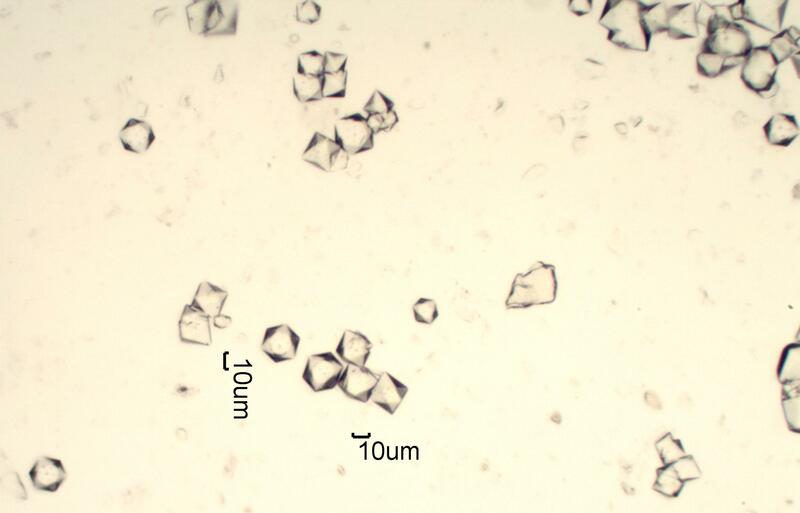 These characteristic isotropic crystals,combinations of cubic and octahedal habits, indicate the presence of aluminum. This was from a test of a white powder found on some air handling equipment that had been stored wrapped in plastic in a covered but uncontrolled environment. Aluminum in dilute sulfuric acid solution can be detected with cesium sulfate. These characteristic isotropic crystals,combinations of cubic and octahedal habits, indicate the presence of aluminum. This is a standard micro-chemical test from the HANDBOOK OF CHEMICAL MICROSCOPY, by Chamot and Mason. White powders in HVAC condensation pans, around aluminum beams, pipes, etc. are often aluminum corrosion products, typically Al(OH)3 with some hydration. If the deposit has aged in the air it may collect carbon dioxide and form a hydroxide/carbonate complex. These corrosion products go into solution in dilute sulfuric acid. A few small crystals of cesium sulfate can be added directly to the solution and the characteristic crystals will begin forming immediately. The crystals will grow for a time so letting them sit for ten minutes or so may make identification easier. If the aluminum was in contact with cement, wallboard, cinder block, or limestone, even natural minerals in the environment high in calcium then gypsum crystals will also form. This are birefingent so are easily identified and cannot be confused with cesium alum. Chamot, Emile Monnin and Clyde Walter Mason, HANDBOOK OF CHEMICAL MICROSCOPY, Volume II, pp. 176-8, 1940.